Earlier this year in April, Sony announced plans to release two unique Android Honeycomb tablets in Fall. Sticking to schedule, today marks the pre-sale for the Tablet S and the Tablet P which will hit store shelves next month. Unlike most tablets which feature a single-piece slate form factor, the Sony Tablet P goes for an entirely different approach. Somewhat reminiscent of the Kyocera Echo smart phone, this tablet features two 5.5 inch displays which fold shut thanks to a clam shell design. The dual-screen technology enables multitasking capabilities. For instance, users can have a video playing on one screen while browsing the web on the other. Reading a book with a page on each screen also makes for a great experience. Surprisingly, the Tablet P weighs just .83 pounds which is less than both the Apple iPad 2 and the Samsung Galaxy Tab 10.1. The Sony Tablet S features a more traditional form factor with a 9.4 inch display. It weighs slightly more than the Tablet P coming it at 1.33 pounds, but it does have some unique aesthetic elements. Sony touts an asymmetric design with a shifted center gravity for holding comfortably even for hours of use. The sloped shape also makes viewing the screen easier when resting on a flat surface. An optional charging dock will enable a digital photo frame feature and an alarm clock mode. Both models run Android 3.1 Honeycomb on Nvidia’s Tegra 2 mobile processor. Sony even claims an update for Android 3.2 will be ready by the time these devices ship. The Tablet P and Tablet S also have built-in WiFi, Bluetooth support, a microUSB connector, SD card reader, and are 4G capable through AT&T. There are front and rear facing cameras on both devices too. 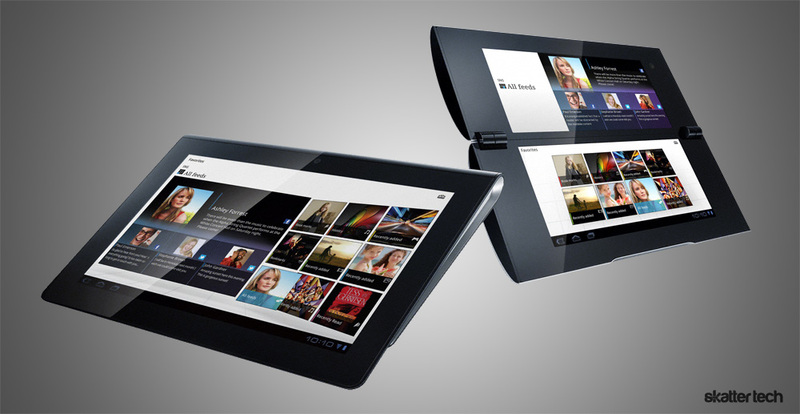 These tablets are also feature the Sony TrueBlack display technology which supposedly reduces reflection from sunlight and even in-door lighting for improved visibility. As expected, these tablets ship with a wide array of Sony services. Video Unlimited offers movie purchases and rentals while Music Unlimited includes access to a library of 10 million songs. With PlayStation Certification, these tablets are great for gaming and Sony already includes Crash Bandicoot and Pinball Heroes out of the box. While some users might stick to Amazon Kindle or Google Books, Sony includes access to its own Reader Store as well. Another addition is Personal Space which is a photo and video sharing service. Sony also offers DLNA support for sharing media with compatible devices such as its own BRAVIA line up of TVs. The Sony Tablet S is will ship in 16 GB and 32 GB models for $499 and $599, respectively. The company unfortunately quietly left out any word of pricing for the dual-screen Tablet P. We should get our hands on both models for review so stay tuned.